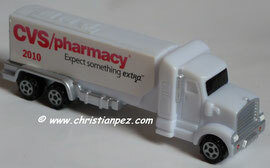 CVS Pharmacy, or simply CVS, is the second largest pharmacy chain in the United States (after Walgreens), with approximately 7,027 stores in 45 states and Puerto Rico. As the retail pharmacy division of CVS Caremark, it sells prescription drugs and a wide assortment of general merchandise, including over-the-counter drugs, beauty products and cosmetics, film and photo finishing services, seasonal merchandise, greeting cards and convenience foods through their CVS Pharmacy and Longs Drugs retail stores and online through CVS.com. It also provides healthcare services through its MinuteClinic healthcare clinics as well as their Diabetes Care Centers. Most of these clinics are located within CVS stores. Havoline is a motor oil brand of Texaco, a former major oil company based in the United States that is now merged with the Chevron Corporation. First introduced in 1904, the Havoline brand was named by Havemeyer Oil Company of New York. In 1906 the Havoline Oil Company separated from the Havemeyer Oil Company. In May 1909, It was bought by the Indian Refining Company, and registered as an official product of the company but kept the logo. By 1910, the Indian Refining Company already had the Havoline oil manufactured. To boost sales & advertise the product they offered to fuel the first plane to fly coast to Coast. Over 300 auto makers wanted it. In 1915 due to over production they had to halt operations. In 1931 it once again changed hands when the Texas Oil company (now Texaco) bought the Indian Refining Company. In 1946 a break through in technology improved Havoline. In 1962 they changed the logo, replacing the old Indian logo. That same year new products were introduced, Havoline 10W-30, and Havoline Singlegrade. In 1968 Improved Havoline & All Temperature Havoline were introduced, followed by Havoline Super-Premium All Temperature Motor Oil in 1971. In 1972 they scored big when they sponsored Emerson Fittipaldi who became a world champion in Formula One. In 1978 they sponsored Janet Guthrie, a CART and Nascar driver. In 1979 Texaco ends the decade with a new product called Havoline Supreme 10W-40, which superseded Havoline Super-Premium. In 1984 a major breakthorugh came with the SAW 20W-50 to keep up with growing demand. From 1986-2002 They sponsored the Robert Yates Racing #28 which is now the #38, Havoline's last sponsorship was with Juan Pablo Montoya in the #42 Dodge for Chip Ganassi Racing with Felix Sabates. At the end of the 2008 NASCAR season, Texaco Havoline officially ended their sponsorship with NASCAR and the Chip Ganassi Racing Team. This brings to a close a 20-plus year relationship with the sport. After ending its sponsorship with NASCAR, Havoline became a “Corporate Champion” sponsor of the Atlantic Coast Conference (ACC)." In 1991 they launched the Formula 3, which became popular all over the world. In 2001 a new logo and package design came out for the whole line of products. In 2001, Texaco merged with Chevron but the Havoline brand name has been retained for all Texaco motor oils and other lubricating products along with anti-freezes. The Havoline brand now carries the Chevron logo. Hollywood Video, a subsidiary of Movie Gallery, Inc. operated from Wilsonville, Oregon, as a DVD and video game rental shop chain in the United States. It was started in 1988 by former CEO Mark Wattles and his wife. The chain was the largest direct competitor of Blockbuster Video until it was purchased by Movie Gallery in 2005. Hollywood Video declared bankruptcy in February 2010 and announced that it would shut down three months later. Hy-Vee is an employee-owned chain of supermarkets located in the Midwestern United States. The company operates over 230 supermarkets which are located throughout the Midwest in Iowa, Illinois, Kansas, Minnesota, Missouri, Nebraska, South Dakota and now Madison, Wisconsin. Hy-Vee also operates liquor stores under the names Hy-Vee Wine & Spirits. Most Hy-Vee stores are full-service supermarkets with bakeries, delicatessens, banks, florists, pharmacies, and coffee shops (Caribou Coffee and Starbucks). Hy-Vee has also added gas stations with convenience stores to some of its properties. Customers are often given a discount of several cents per gallon of gas when their grocery receipt is shown; the discount can often run between three cents a gallon, to as much as twenty cents a gallon, depending on the register receipt when purchasing grocieries. Hy-Vee is known for its longtime advertising slogan, "Where there's a helpful smile in every aisle". The slogan was adopted for Hy-Vee's first television commercial in 1963. When the jingle became a full song in the '90s, its music was written by Annie Meacham and James Poulsen. Two-time National Football League MVP and three-time Super Bowl player Kurt Warner once stocked shelves at a Hy-Vee store in Cedar Falls, Iowa. After being cut by the Green Bay Packers at age 24, he thought his football career might be over and worked there to cover bills. Actor Ashton Kutcher is also a former Hy-Vee employee. Hy-Vee's largest store is located in Sioux Falls, South Dakota, which has over 100,000 square feet (9,300 m2) of retail space in the store. Consumer Reports Ranked HY-Vee the No.9 Supermarket in 2012,behind only Wegmans,Trader Joes,Publix,Fareway,Costco,Harris Teeter,Market Basket,And Raleys'. DeMoulas Market Basket, more commonly known as Market Basket, is a growing chain of 69 supermarkets in New Hampshire and Massachusetts. Its footprint spans from central New Hampshire to south eastern Massachusetts with headquarters in Tewksbury, Massachusetts. Market Basket's most recent expansion brought it to Cape Cod in 2012. Market Basket will expand into Maine with a store to be built at the site of a former Lowe's in Biddeford. Movie Gallery, Inc. (former NASDAQ ticker symbol MOVI) was the second largest movie and game rental company in the United States, behind Blockbuster Video. The company rented and sold Blu-ray Discs, DVDs, VHS tapes, and video games. Founded in Dothan, Alabama, the company was headquartered in Dothan, and later, in Wilsonville, Oregon. On April 30, 2010, Movie Gallery announced it was closing and liquidating all of its stores per a filing of Chapter 7 bankruptcy. At its peak the firm had about 4,700 stores in North America, operating mainly under the Movie Gallery, Hollywood Video, and Game Crazy brands. The last of the company's stores were closed in August 2010. Most regular Movie Gallery locations were located in rural areas, while Hollywood Video locations, which competed directly with Blockbuster Video, were located in urban areas. Nivea is a global skin- and body-care brand, owned by the German company Beiersdorf. The company was founded on March 28 1882 by pharmacist Carl Paul Beiersdorf. In 1900, the new owner Oskar Troplowitz developed a water-in-oil emulsifier as a skin cream with Eucerit, the first stable emulsion of its kind. This was the basis for Eucerin and late Nivea. Nivea comes from the Latin word niveus/nivea/niveum (meaning snow-white). During the 1930s, Beiersdorf began producing products such as tanning oils, shaving creams, shampoo and facial toners. The trademark "Nivea" was expropriated in many countries following World War II. Beiersdorf completed buying back the confiscated trademark rights in 1997. Internationalisation during the 1980s propelled the Nivea brand to a wider global market. Price Chopper is a Canadian chain of discount food stores owned by Sobeys Inc.. Price Chopper is not related to chains with the same name in the United States or New Zealand. In the late 1990s the chain acquired additional locations after its former parent company, Oshawa Group, was acquired by Sobeys. On May 12, 2010, 8 Price Chopper locations in Brampton and Mississauga, Ontario, were converted to FreshCo stores. FreshCo aims to cater to budget-conscious, multicultural customers, and Sobeys Inc. plans to convert more of its 87 Price Chopper locations to the FreshCo format. Safeway Inc. (NYSE: SWY), a Fortune 500 company, is North America's second largest supermarket chain after The Kroger Co., with, as of December 2010, 1,694 stores located throughout the western and central United States and western Canada. It also operates some stores in the Mid-Atlantic region of the Eastern Seaboard. The company is headquartered in Pleasanton, California. Supermarket News ranked Safeway No. 4 in the 2011 "Top 75 North American Food Retailers" based on 2010 fiscal year estimated sales of $41 billion. Based on 2009 revenue, Safeway is the 11th largest retailer in the United States. Sheetz, Inc. is a chain of gas stations/convenience stores owned by the Sheetz family. Stores are located in Maryland, North Carolina, Ohio, Pennsylvania, Virginia, and West Virginia. Sheetz has long employed the "Z" that the name ends with in various marketing efforts. These include Sheetz' re-loadable gift card- The "Z" card, the Sheetz breakfast sandwich – known and marketed as "Shmuffinz," and their "Nachoz." Headquartered in Saratoga Springs, the company is well-established, particularly in the Capital District. Within New York, its stores can be found as far north as the Canadian border towns, as far west as Oswego and as far south as Goshen at the northern fringe of the New York metropolitan area. Its Vermont outlets can be found in Rutland and Bennington counties. Known for branded ice cream, potato chips, milk, coffee and other drinks, the stores often include gasoline pumps. In addition, most also feature a small dining area, not common in U.S. stores of this type. There are now 328 shops in operation. Toys"R"Us (styled as Toys "Я" Us), founded in 1948, is a dedicated toy and juvenile-products retailer headquartered in Wayne, New Jersey, United States. The company operates more than 875 Toys"R"Us and Babies"R"Us stores in the United States, more than 625 international stores and over 140 licensed stores in 35 countries and jurisdictions. In addition, it exclusively operates the FAO Schwarz brand and its flagship location in New York City. It also operates a portfolio of e-commerce sites including Toysrus.com, Babiesrus.com, eToys.com and FAO.com. Virsona Pez Trucks were created in 2007 for the www.virsona.com website. top of each truck. There are 8 different trucks, with production of 125 of each. The majority of these were given out at electronic and computer software trade shows. Les Virsona Pez Trucks ont été créés en 2007 pour le site www.virsona.com. Ce fut une production limitée de 1000 camions, et ce fut une commande spéciale à PEZ. 100 % authentique produit Pez. Le logo Virsona est imprimé sur le côté de de chaque camion et le nom de domaine internet www.virsona.com est imprimé sur le dessus de chaque camion. Il y a 8 camions différents, avec une production de 125 chacun. La majorité de ceux-ci ont été distribués au "electronic and computer software trade show. Walgreen Co. (NYSE: WAG), d/b/a Walgreens (without an apostrophe), is the largest drugstore chain in the United States. 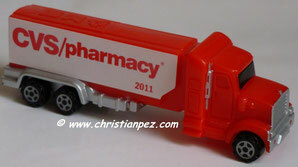 The company operates 7,600 drugstores across all 50 states, the District of Columbia and Puerto Rico. Walgreens provides access to consumer goods and services and pharmacy, health and wellness services in America through its retail drugstores, Walgreens Health Services division and Walgreens Health and Wellness division. Walgreens Health Services offers pharmacy patients and prescription drug and medical plans through Walgreens Health Initiatives Inc. (a pharmacy benefit manager), Walgreens Mail Service Inc., Walgreens Home Care Inc., Walgreens Specialty Pharmacy LLC and SeniorMed LLC (a pharmacy provider to long-term care facilities). Walgreens Health and Wellness division includes Take Care Health Systems. Walgreens has 7,600 drugstores as of September 30, 2010. Walgreens was founded in Chicago, Illinois in 1901, and has since expanded throughout the United States. Its headquarters is located in the nearby suburb of Deerfield, Illinois. Wawa Inc. is a chain of convenience store/gas stations located in the Mid-Atlantic region of the United States. It operates in Pennsylvania, New Jersey, Delaware, Maryland, and Virginia. The company's corporate headquarters is located in Chester Heights, Pennsylvania, near the community of Wawa. Wegmans Food Markets, Inc. is a family-owned U.S. regional supermarket chain headquartered in Gates, New York, near Rochester. Wegmans has more than 75 stores spread across the mid-Atlantic region, in New York, Pennsylvania, New Jersey, Virginia, Maryland and in 2011, Massachusetts. Founded in 1916 in Rochester, New York, Wegmans has appeared on Fortune's annual "100 Best Companies to Work For" list since its inception in 1998, and has ranked among the top 10 for eight consecutive years. Food Network recognized it with its award for Best Grocery Store in 2007] and Consumer Reports ranked it the top large grocery chain in the United States in 2009. Winn-Dixie Stores, Inc. (NASDAQ: WINN) is an American supermarket chain based in Jacksonville, Florida. Winn-Dixie has ranked number 24 in the 2010 "Top 75 North American Food Retailers" based on 2009 fiscal year estimated sales of $7.3 billion by Supermarket News.and was ranked the 43rd largest retailer in the United States based on 2006 revenues by Stores magazine. Winn-Dixie currently operates 485 stores in Florida, Alabama, Louisiana, Georgia, and Mississippi. The company has existed under its present name since 1955 and can date its roots back to 1925. Prior to filing for Chapter 11 bankruptcy in 2005, Winn-Dixie was listed in the S&P 500 and had been traded on the New York Stock Exchange under the ticker symbol "WIN" since February 18, 1952. The company is currently traded under the symbol "WINN" on the NASDAQ. The bankruptcy also left the chain with fewer stores than it had in the late 1960s. They are known for their private label Chek brand soft drinks, which are produced in over 20 different flavors plus diet and caffeine-free varieties—one of the widest assortments. They have also been known as "The Beef People". In its advertising and print media Winn-Dixie now uses the brand promises of "Fresh Checked Every Day" in its Jacksonville DMA, "Getting Better All The Time" in its locations in Central Florida, "El Sabor De Tu Pais", or "The Flavor Of Your Country", in its Miami area stores, and "Local Flavor Since 1956" in its Louisiana area stores.